Phoenix Rising; Sculptor and Woodcarver Ian G Brennan; How he first started his career as The Sculptor to the Royal Household. 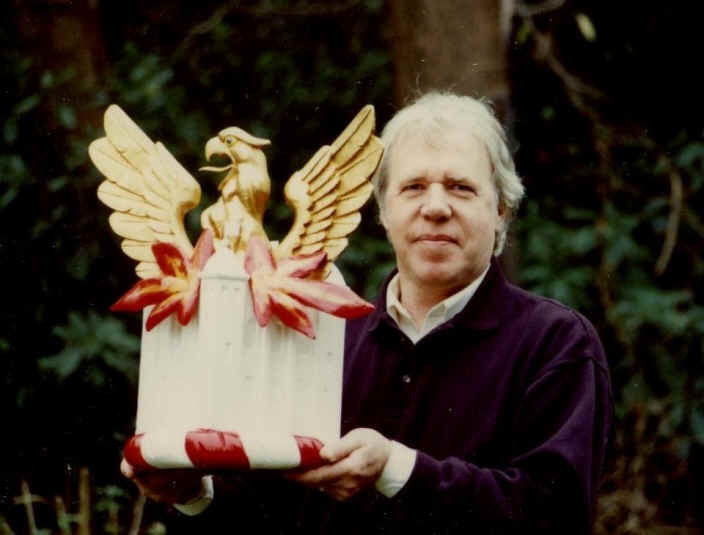 A quite remarkable true story about Ian G Brennan's determination to recover from losing his furniture making business in a fire in 1984; to then discovering to his amazement that he had a completely unknown, natural ability to be a sculptor. 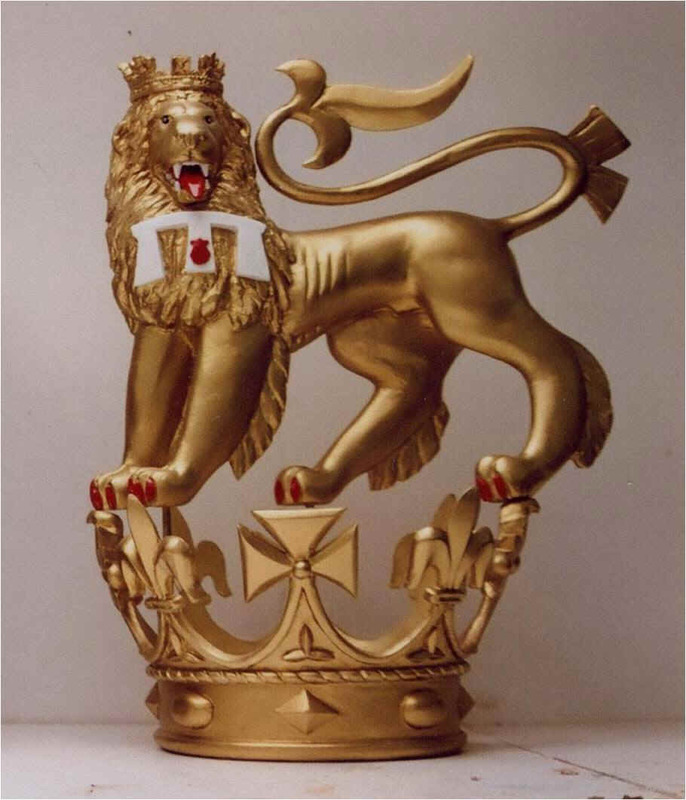 Within five years of the fire Ian was official appointed the Sculptor to the Most Noble Order of the Garter and Honourable Order of the Bath, since then Ian has been commissioned to create 107 unique sculptures in both wood and bronze for the British Royal Household. Ian G Brennan has now been a professional sculptor and woodcarver for over twenty five years and although he produces limited bronze editions of his realistic sculpture, the vast majority of his work is involved with a wide variety of highly detailed original commissioned sculptures depicting many different subjects in a variety of materials including wood, resin, marble, sterling silver and bronze. Ian is one of those rather rare sculptors that both carves and casts, his highly detailed realistic, naturalistic and heraldic wood carvings, bronze and silver sculptures have been commissioned for Windsor Castle, Westminster Abbey, St Paul's Cathedral, Museums, Government Buildings, Churches, Company receptions and private art collections all over the World. These commissions are as diverse as producing sculptures designed to suite the history and splendour of centuries old buildings such as Windsor Castle, Westminster Abbey and St Paul's Cathedral were his rather unique skills in reproducing wood carvings and bronze sculpture from a by-gone age are often required; to the more modern surroundings of Company receptions and more recently the elegance and grandeur of the Grand Lobby of the Cunard Liner Queen Victoria. During the past decade Ian's had been working almost exclusively to commission therefore exhibitions in art galleries became a rather a rare event. Exhibitions of Ian’s wood carving, silver and bronze sculpture he has collected over the past twenty years have therefore been almost exclusively set in the somewhat more formal surroundings of Museums; The Queens Room onboard the Cunard Liner QE2; Carpenters Hall in the City of London, Burlington House, Home of the Royal Academy of Arts and within the magnificent historic setting of St George's Chapel in Windsor Castle, where Ian has also been invited on a number of occasions to give fully illustrated talks about his work and career.. 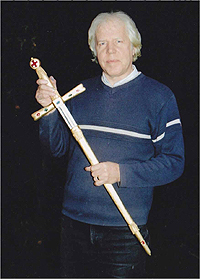 In 1989 Ian was officially appointed the 'Sculptor to the Most Noble Order of the Garter and Most Honourable Order of the Bath' and since that time he has spent an average of five months of each year working exclusively on a wide variety of unique sculptures for the British Royal Household. 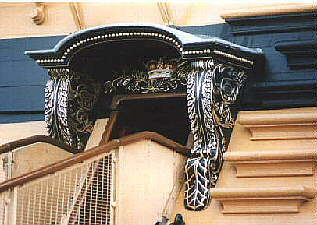 Initially these commissions for the Royal Household were mostly traditionally heraldic in design, often involved with creating the original carved, painted and gilded Royal Crowns, Coronets and Crests for the newly installed Ladies and Knights of the Garter, along with the carved and painted Crests for the newly installed Knights of the Bath. However from 1993 onwards these commissions for the Royal Household also included creating a wide variety of private sculptures in both wood and bronze. These private commissions now account for around a third of the time Ian spends working for the Royal Household. Many of these private commissions for the Royal Household are far more realistic in design than some of the more traditional sculptures commissions Ian also receives, all of which are created in fine detail. 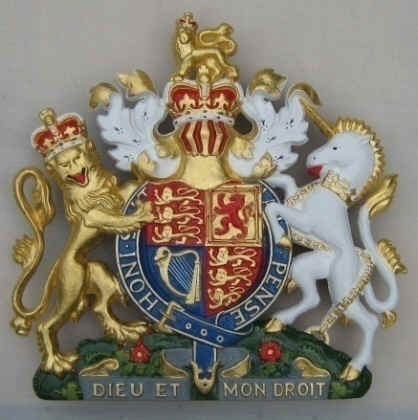 The subjects also often vary from the more traditional heraldic sculptures, such as Royal Lions, Griffins and Unicorns; to subjects more naturalistic in style and include lifelike sculptures of Dogs, Pheasants and Horses, as well as wide variety of sculptures depicting the human form. For the most part these commissions Ian receives for the Royal Household are usually quite evenly spaced out throughout the year and he is often found working on several totally different sculptures all at the same time, however on occasions one of these sculptures is required more urgently and therefore has to take precedent over the others. Although the sculptures are usually commissioned well in advance on one recent occasion in particular, a sculpture was commissioned in late February for a service to be held in a few months time in Westminster Abbey and was completed and delivered just days before the service took place. Seventy three of these one hundred and seven commissions Ian has received to date from the Royal Household are currently on public display in Westminster Abbey and Windsor Castle. As well as commissions for the British Royal Family, there have also been a wide variety of unique commissions for other Royal Families including HM King Juan Carlos of Spain, HM King Harald V of Norway, HM Queen Beatrix of the Netherlands and His Imperial Majesty Emperor Akihito of Japan. 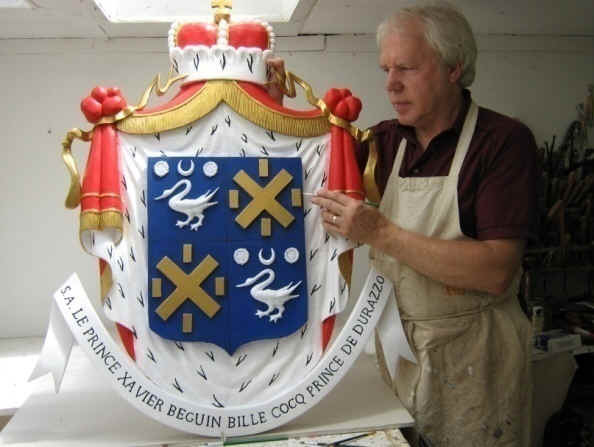 These diverse commissions for the Royal Household can also be well illustrated when Ian’s was recently commissioned to create sculptures of a Stag, Labrador and a Mute Swan along with the Royal Crest and Sword for HRH Prince William of Wales; The Duke of Cambridge. Ian was also informed by HM The Queen at Windsor Castle that HRH Prince William was now to become the 1000 Knight of the Garter to hold this the highest order of chivalry, since 1348. Ian G Brennan's has also received commissions for other members of the Royal Family include a pair of similar sculptures created for HM The Queen's two sons, HRH Prince Edward, The Earl of Wessex and HRH Prince Andrew, The Duke of York when they were appointed Royal Knights of the Garter along with the gilded Coronet for HRH Princess Anne the Princess Royal when the princess was made a Lady of the Garter..
What a difference a decade can make; after ten years of hard work Ian G Brennan had built up his own successful furniture making furniture, however with a full order book, plans to expand and about to take on new staff this was all to dramatically change when his workshop and the contents were totally destroyed in a fire. Worst was to follow when Ian later discovered there was a problem with his insurance cover which meant he was uninsured and had lost everything in the fire. This problem with the insurance proved to be just the start of Ian's troubles, although his customers who's orders were lost in the fire were very understanding and were prepared to wait for their furniture and new kitchen orders to be replaced, his Bank who he had an account with for nine years were not. Ian's first task was now to try and find a new Bank who would consider taking over his overdraft facility and also give him a bit of a breathing space to enable him to stay in business. Without any assistance from his own bank he obviously could now no longer afford to replace his tools and equipment, pay his bills let alone now try and find the rent for a new workshop. Ian simply had no choice but to clear him a space amongst the rubble, borrow some electricity from a friends adjoining workshop, replace the burnt out telephone, hire some tools and start again. At 4.47am on the 7th May 1984, Ian G Brennan was awoken just before dawn by a loud banging on his front door. A police officer had come to tell him that his business had been totally destroyed in a fire and could he meet with him as soon as possible at the workshop. When he arrived at his workshop shortly afterwards which was just a few miles from his home there were two fire engines an ambulance and the police office in his car, parked near to where his workshop once used to be. 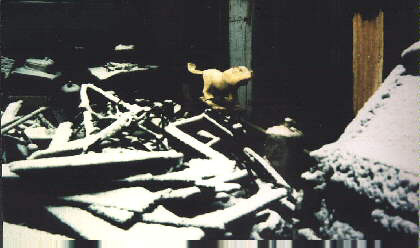 The whole building had been burnt completely to the ground, although his heavy woodworking machines were still there they had partially melted in the intense heat and was still glowing red hot in the dawns early light. 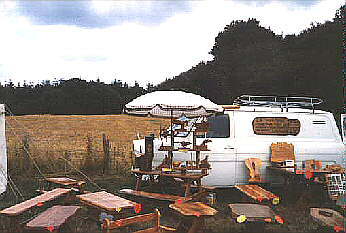 The large caravan which had been parked alongside Ian's workshop for many years which had been used by the all the small businesses near his workshop as a rest room was believed to be the source of the fire, someone was believed to have left the electric fire on over night which subsequently set fire to his and an adjoining workshop. All his completed furniture, designs and templates, machinery, tools, prepared timber and a completed solid oak kitchen awaiting delivery had all been destroyed in the fire. 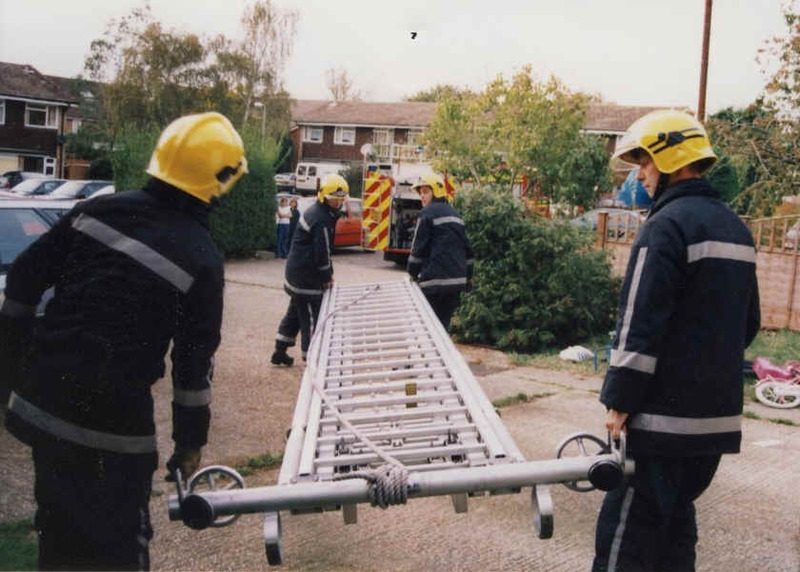 Worst was to come, as he was later to discover there was now a problem with his insurance cover for the workshop, which meant he was uninsured and had lost everything in the fire. Ironically as it turned out the new workshop Ian was planning to move into just four days later was fully insured but empty. 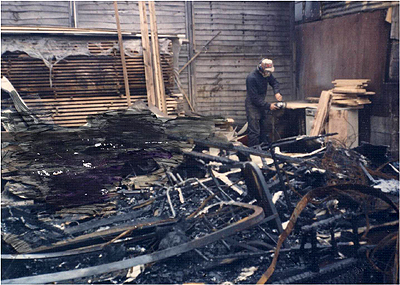 The remains of the fire damaged workshop and what £25,000 worth of completed furniture orders, designs, machinery and tools look like after a fire. Some of the furniture Ian had been working on just before the fire had fortunately been removed earlier from his workshop and delivered to the customer. 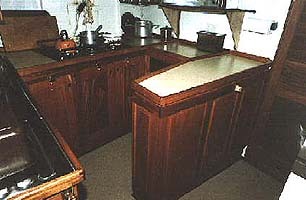 These included the majority of the solid mahogany units Ian had built for the Galley of the J Class Yacht 'Velsheda' which was shortly to take part in the Tall Ships race, although unfortunately some of these mahogany units for the Velsheda’s galley were still in the workshop awaiting delivery and were consequently destroyed in the fire. Several weeks earlier Ian had decided to removed the two huge cedar logs that he had been seasoning inside the workshop outside, to give him a bit more room so he could not only set out the Velsheda's galley but also the solid oak kitchen he had also been working on. These hundreds of square feet of high quality cedar wood timber were fortunately now seasoned and safely stored away, as it turned out far enough from the workshop and although a little charred on the edges, were undamaged in the fire. He at least still had a supply of timber to use for many of his projects, even if he now no longer had the tools, woodworking machinery or most importantly a workshop to put it all in. "During the early afternoon on the day of the fire, the remains of the workshop had cooled down sufficiently enough so we could start scouring through the debris on the floor of the workshop trying to salvage anything of value that I either use or be sold as scrap metal. I then noticed to my amazement although many of my tools and heavy metal woodworking machinery had melted or were bent and twisted in the intense heat of the fire, a small section of a the remains of a wooden roof beam although charred on the outside had strangely burnt to a rough shape resembling a leaping dolphin, after showing my wife the unusual piece of burnt wood, I put it to one side for a moment and continued to search through the rubble". When Ian eventually got home one of the first things he tried to do was to contact as many of his customers he could to inform them of his current difficulties and that unfortunately there would now be a delay in re-making their orders. He managed to contact all except one of these customers who with out exceptions were very sympathetic and just as importantly were willing to wait for their furniture orders to be rebuilt. "After contacting the customers and subsequently securing these orders knowing I still have work and potential money coming in. I made an appointment with my bank manager who fortunately I had good working relations with for many years. I was not asking to borrow a lot more money, I was just hoping to borrow enough money to enable me to hire some tools and materials for a few weeks and also if possible perhaps for the bank to honour my standing orders just for a few months until I could get things sorted out." The bank manager at his local branch was like his customers, very sympathetic and said he is however obliged to inform the banks head office and would get back to him shortly. Whilst Ian was waiting to hear back from the bank he and his wife Suzanne spent the next few days continuing to shift through the remains of his burnt out workshop trying to find anything they could salvage from the fire. Just a few days after the meeting with my bank manager the eagerly awaited letter from the Banks head office arrived at my home. On opening the letter, initially the wording of the letter appeared quite sympathetic however the letter soon became less than friendly with the more sinister undertones quickly becoming apparent. The letter concluded with the very clear message which basically meant, as I would appear to be know longer in the position to honour my monitory obligations to the bank, that if all my borrowings now owed to the bank was not repaid within seven working days, the bank would start proceedings without further notice to reprocess my home. After losing his workshop in the fire, then discovering he was no longer insured and consequently having no money and obviously now no support from the bank, any thoughts of moving as previously planned into another workshop quickly disappeared.. The person who Ian was renting the workshop from decided he would not rebuild it and he would instead, once the site was cleared of the debris, use the space for much needed parking for the nearby businesses. He said however he was in no particular hurry and I could stay there working for a while if I wished, however he said if I did decided to rebuild a workshop on the site he would have to charge rent for it, which was fair enough. "The owner of the site of the workshop was also quite happy for me to build some sort of make shift shelter leaned up against the neighbouring workshop wall for a time which was most helpful. The adjoining workshop dropped over an electrical cable so that I now had light and power which enabled me to then hire some wood working power tools to start again. The destructive power of the fire was however total, virtually nothing usable remained intact. The whole contents of his workshop were worth around £ 25,000, a rather large amount of money today, but over twenty years ago more so. Everything including the many huge three phase wood working machinery was worth just £ 96 in scrap metal".. The following morning Ian was up early to the site as the scrap dealers were due to start collecting the remains of the heavy machinery, a few hours later the burnt out machines were gone and anything worth salvaging was either sold as scrap or stored away in a friends nearby workshop. The £ 96.the scrap dealers had given Ian was not a lot, but it was enough to be able to now hire some wood working tools which would enable him to start work on producing the customers orders once again.. Although Ian had tried on several occasions the one customer he had not yet not manage to contact about the fire, was the married couple who had patently waited for their hand made oak kitchen to be completed. It had taken Ian many months of work to complete all the beautifully crafted solid oak kitchen units and work surfaces. The customers had seen the kitchen a few days before the fire, which was completed and awaiting delivery and fitted in their home the following week. As with most of his orders Ian received a deposit and stage payments which enabled him to not only to purchase the materials, but to also work on constructing the fitted kitchen. This particular customer at this stage had paid Ian £ 3,000 in stage payments out the £ 5,000 total cost of the oak kitchen and the customers were obviously eagerly awaiting Ian to deliver and install their brand new kitchen. As Ian was busily erecting a small corrugated iron roofed shelter to be used as his temporary workshop, a car slowly pulled up alongside. 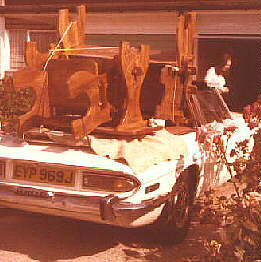 The man in the car was in fact the same man who a week earlier was admiring his completed oak kitchen. He stopped the car and after looking at the ruins of the workshop, wound down the window and simply said "It wasn't in there was it?" I replied "I am afraid it was". As he got out of his car and walked towards me he asked me what was going to do now. I explained the problems I was now having with the bank and the insurance, but just as quickly I said that if he would again be patient and allow me the time, I would rebuild his new kitchen as soon as possible. "I was at this stage no doubt just like the customer, acutely aware of the £ 3,000 deposit he had already paid and he had the receipts to prove it, along with my intention to complete the kitchen about this time. He turned around without saying a word and walked back to his car, after a few moments he retuned and handed me a piece of paper. 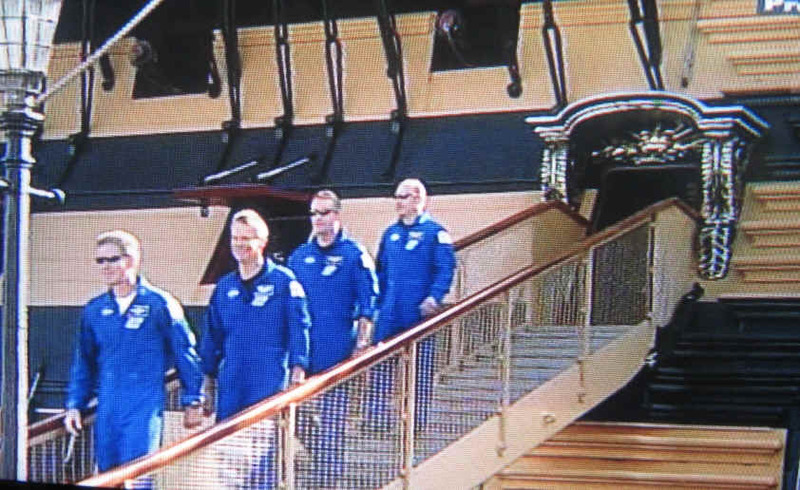 He said " I see you have a few problems so here is a further advance towards our kitchen,. it was a cheque for £1,000. he continued "we are prepared to wait for the kitchen a bit longer, hope this might help keep the bank of your back for a while." I was completely taken aback, here was a relative stranger handing me a £1,000 life line and the bank I have been with for almost a decade were desperately tying to do the complete opposite. "Although I still had a full order book with many months of work as the bank was being very difficult I knew I would have to try and finding another bank, although it was obvious under the circumstances trying to find a new bank which would take over my overdraft would prove to be difficult". In the nearby Town Ian decided to make appointments with as many different banks as possible all on the same day, starting from one end of the Town to the other. These appointments were evenly spaced out at roughly hourly intervals starting at 10.00 am, with the last appointment which he hoped he would be able to cancel at 3.00. pm. "Some interviews with the different bank managers turned out to last longer than others but the results were unfortunately still the same, "I am sorry but we cannot help you", it appeared a lot of British Banks only lend you money if you do not need it. After several disappointing interviews things started to look rather bleak, fortunately however the second to last Bank left on my list finally agreed to take over my overdraft and just as importantly allowed me a three months break from loan repayments. This would enable me the vital time needed to try and sort the business out. "On tidying up the last pieces of his old workshop amongst the rubble on the workshop floor I once again came across the old burnt piece of wood which I had found on the day of the fire. Using my pen knife and one of my old wood rasps its wooden handle I had found on the floor early, I soon cleared away the burnt wood on the beam and eventually complete what the fire had started." 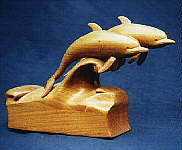 Ian explained, I had never tried to carve anything in wood before, but before to long the dolphin was completed. My wife suggested perhaps I try and carve and identical dolphin to see if the first carving was just a fluke." 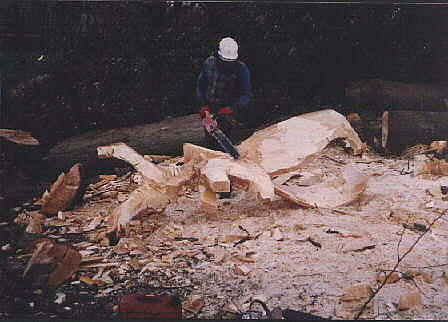 "I found working on the carving quite therapeutic it helped to take your mind of things a bit. My wife reminded me that I had a set of carving chisels somewhere in the garage at home that might now be of use, these chisels were purchased in a job lot of woodworking tools at an auction some years earlier but I had never found a use for them. Although they were old and had see better days, they were of good quality and soon sharpened up well. They were proving to be very useful and soon got used to working with them, especially as they were now the only woodworking tools I possessed.. The first wood sculptures Ian carved were a pair of' Leaping Dolphins ' at 6 inches high and an Otter at 8 inches high, both of which he has retained. Although Ian obviously does not consider these first sculptures his finest work, they are however his first attempts at woodcarving which was to become the beginning of his new career as a sculptor, now working in wood, marble, resin, sterling silver and bronze. Further woodcarvings quickly followed simple sculptures at first but soon much larger and more complex pieces started to appear, now all being carved from a single piece of wood. 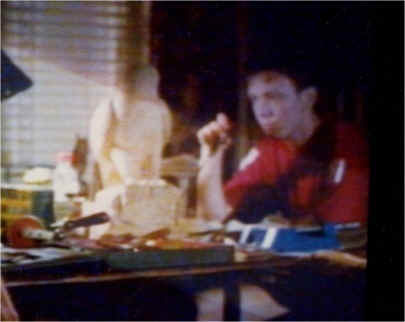 During the first year or so Ian was obsessed with carving almost anything and in any material he could find. 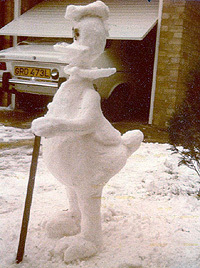 It felt as if he was almost trying to make up lost time perfecting his new found skill, even when he got home this experimentation even extended to producing a simple 'Donald duck' sculpture made from snow in his front garden. As Ian was totally self taught as a wood carver he had to try and learn how to use carving tools and also the various techniques required, simply by trial and error. Particularly difficult was the challenge of trying to carve many totally different subjects in fine detail all from a solid block of wood which leaves no room for mistakes. Two of Ian's early experimental wood carvings were the 'Serengeti scene' which was a sculpture depicting many types of African animals which were all carved together from a solid blocks of lime wood, these animals included lions, hyenas, hunting dogs, vultures etc. 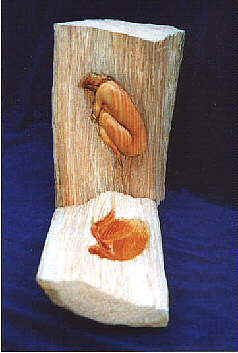 The other experimental wood carving was to be a version of Michelangelo's David, both were chosen not only as the subjects were totally different but also the technique required to work on both sculptures would require a totally different approach. Ian started taking more interest in some sculptors work from long ago particularly he feels the best sculptor of all Michelangelo. He found the detail such renaissance masters achieved in their work most inspiring. After visiting a local saw mill seeking their advice on the most suitable timbers to carve, Ian was given a couple of large blocks of lime wood timber to practice on. As he had a photograph of Michelangelo's famous David sculpture he thought he would try and make a copy of it as best he could at the time. Obviously as he hadn't been carving very long so was a rather ambitious project, but he found he could learnt a lot trying to discover the technique used in carving from a solid block with his new found carving chisels. As working on reproducing the David sculpture was meant to be a carving exercise and if completed could never be anything more than a rather amateur copy of someone else's rather special creation, eventually with valuable carving lessons learnt work on both the David sculpture along with the carving of the 'Serengeti scene' were eventually abandoned unfinished and now both carvings gather dust at the back of Ian’s studio. "Throughout this first year I had managed quite well in my new 'open planned' working environment although It was rather exposed to the elements the weather did not effect my work to much apart from a few weeks of snow, which unlike the rain managed to get in everywhere and then simply melt underfoot, I didn't help either as I have never been able to function very well in cold conditions. Although I got used to working under the temporary shelter after a while, I badly missed my woodworking machinery especially the large woodplaning particularly a few weeks earlier you could simply place a roughed out piece of timber into one end of the planer a few seconds later with one just pass through the machine the wood was totally smooth. The same process especially making table tops now took me many hours to complete planing the wood by hand. When I first started my business I didn't have any good wood working machinery and was quite used to working entirely with hand tools, however once you had scrimp and save for many years and finally managed to get together some good woodworking machinery only then to lose them this way and then having to go back using hand tools, somehow made it feel much worse. Without a proper workshop or indeed a showroom and having now completed the customers orders that were lost in the fire, I had to find other outlets to exhibit my newly completed furniture, although the replacement phone now fixed to the remains of my workshop wall would still ring with new potential customers, obviously inviting these customers around to my burnt out workshop would not exactly help to inspire the customers confidence in my ability to be able to complete their order, so I had to find some other way to exhibit my furniture. "I decided to work from Monday to Friday making the garden benches, coffee tables etc, under my make shift shelter and on the Friday evening before setting off home I would load up the van for an early start the following morning. We would the drive into the country side and try and find a suitable lay-by alongside a main road to 'set up shop' for the day. Fortunately with all the passing traffic this often proved quite successful in re-generating sales and orders for my furniture ". Whilst waiting for customers to appear with all our furniture set out along the side the road, Ian could often be found sitting inside the van carving the animals and birds from any old pieces of wood he could find.. Eventually when he had completed a few carvings and slowly began to gain a little confidence in his new found skills as a woodcarver he agreed to his wife's repeated requests to display these woodcarvings amongst the coffee tables and garden furniture. Slowly these wood carvings on display also began to generate interest and woodcarving commissions were starting to look a distinct possibility, unfortunately however the perceived distinct lack of experience as a wood carver from many people at the time did cause some difficulties with their confidence in him being able to undertake or indeed complete a potential carving commission, which was quite understandable considering he had only been carving for a few months. Ian spent all his 'spare' time carving and soon found he could carving quite quickly and soon managed to build up a display of different wood carvings. This collection of carvings soon led people to believe he had in fact actually been carving for a quite a few years which were something Ian was quite happy to go along with as soon as the wood carving commissions started to come in. Once work on his furniture orders were complete for the day when he got home Ian couldn't wait to start working on his wood carvings even to the extent of sitting in front of the television in the lounge in the evening often to the early hours of the morning witling away on some small block of wood. A larger order for furniture and various wooden fittings was then received to completely fit out a new 'Wine Bar' with all the wooden tables, chairs, benches, bar stools, garden furniture, bar top and even carving the sign for the Wine Bar. 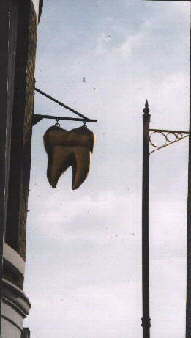 This order soon enabled me to move into new premises not to far away from my old workshop. I could also now start to try and replaced a lot of the lost tools and wood working machinery destroyed in the fire, including one of my first purchases a good second-hand planing machine. 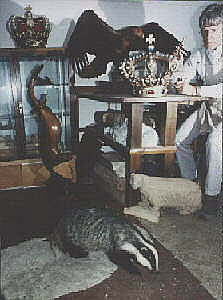 Ian was then able to move away from the various lay-by's and started exhibiting his furniture along with his woodcarvings in his new workshop, Country Fairs and Shows throughout Southern England which proved to be very successful; "However these new found skills as a woodcarver had started to take up much more of my time and interest. 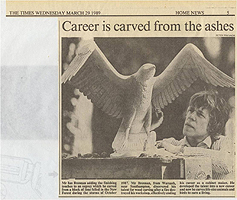 It was then the local press, Television and Radio, who fortunately rather liked the 'Phoenix from the Ashes' type story and how he first got involved with carving. This media interest started to generate a large amount of free publicity which helped considerably in receiving new commissions for my woodcarvings. 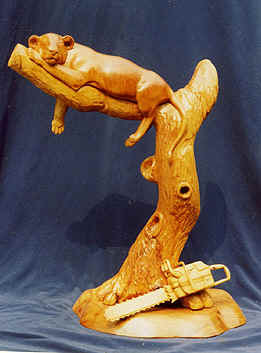 I soon started to get far more inquires for my carvings than for my furniture, so although I had now rebuild the business my interest in making furniture had begun to second place to my woodcarvings so I decided to let the furniture making side of my business run down naturally and to try to concentrate all my efforts on making a potential new career as a woodcarver." "It was tough going over the next few years; I sold some of the wood sculptures and just survived. Being self-taught meant I had to learn from my mistakes and consequently I soon learnt a lot, but as I have always spent my life working on the premise ….‘if all else fails, read the instructions. I felt I was quite well equipped to cope, I certainly hoped so". A local newspaper ran a full feature about Ian's work which was spotted by a Gallery owner visiting friends in the area who asked to see his work and consequently invited Ian to exhibit his wood sculptures in a top gallery in Mayfair, London for a pre-Christmas showing, Ian's first exhibition in an Art Gallery. This exhibition fortunately generated a lot of interest and was extended for a further six months. Trying to get hold of a good selection of carving tools especially good quality wood carving chisels due to the high cost was still a major problem and holding up Ian’s progress somewhat. A friend told him she knew someone that had recently retired and had started wood carving as a hobby for her retirement and that for Christmas her husband had bought her over 200 hundred high quality carving chisels of almost every size and style you could possibly imagine along with vices, mallets, strops and a variety of sharpening stones. 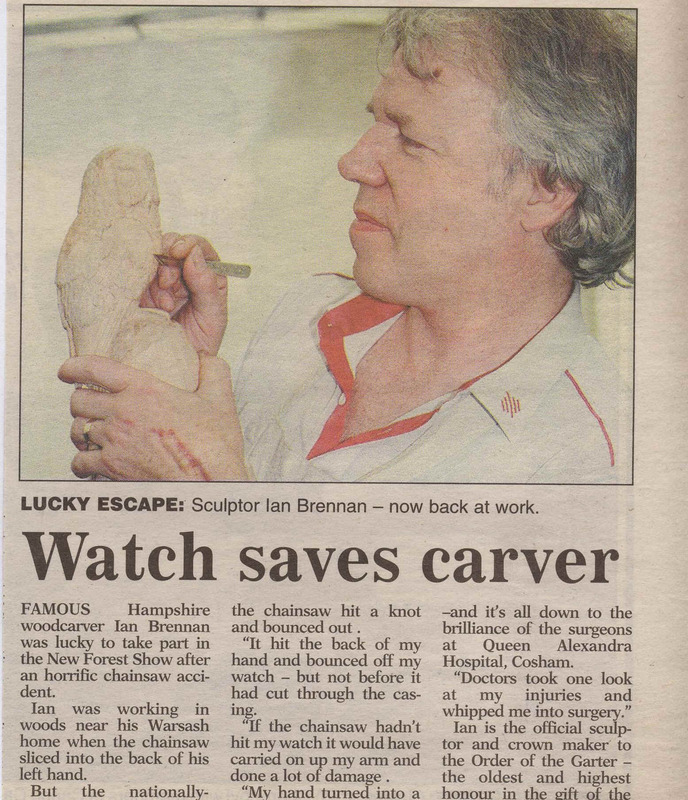 Apparently after several months of effort the lady decided that wood carving was really not for her and as she had seen an article about Ian’s work in the local paper and how he started carving after he had a fire, asked her whether any of the carving tools would be of any use to Ian. Although everyone was quite aware of the value of the tools many of which were still in the box and had never been used the lady insisted she would only except from Ian what amounted to a rather nominal sum of money for the whole lot, it was indeed a most kind and generous offer which was accepted by a very grateful Ian. Ian now had all the carving tools he could ever dream of so he could now really concentrate on quickly building up a collection of his wood carvings. As the commissions for his woodcarving continued and making furniture quickly became a thing of the past it was clear to Ian if had not had the problems with his insurance for the workshop that burnt down , he would have simply moved to another workshop, replaced all the tools and materials lost with the insurance money, put the burnt piece of wood shaped like a dolphin to one side for a moment and would have then no doubt promptly forgot about it in the frantic effort to get back making furniture and would probably still be making furniture today and would not have carved anything. Further exhibitions in many prominent art galleries thought England followed and a few years later the Museum Service toured a larger collection of Ian's realistic wood sculptures to many different Museums across Southern England. This one man exhibition of Ian's work were mostly of wildlife subjects all carved in fine detail with many of the sculptures being life size, such exhibitions helped to get Ian establish in the Art World. "Woodcarving can and often is a relatively slow process just using hand chisels and a mallet, although Ian initially starts work on a large sculpture with a chainsaw to remove as quickly as possible the larger sections of wood, it still often takes quite some time to produce a large sculpture, therefore collect together a good exhibition of wood sculptures which can show all the various aspects of my work takes time and therefore money to build up." Although working on commissions was and still is where most of my time is spent, in the early day it did prevent me from getting a large collection of different sculptures together for such exhibitions. The only way forward was now to try and reduce the amount of commissions I undertook and try to concentrate spending more time on building up some special exhibition pieces. Ian and his wife decided in the end that the only way he could possibly get a large collection of wood carvings together for exhibition was to basically take two years off, work around the clock on the carvings and as the carvings were not going to be available for sale until after the first exhibition, in effect try and work without any money coming in and simply go for it. 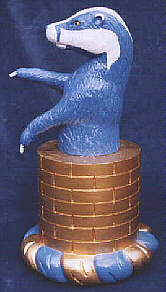 "This idea of no longer making the time available to produce furniture, cutting out commissions and consequently having little or no income unfortunately eventually began to use up the patience of my latest bank manager, so the search was on yet again to try and find another Bank who would possibly help out. Fortunately eventually, I found a new bank manager who agreed to allow me the time and resources to work on producing a large collection of wood sculptures for a major exhibition which had now been planned the following year in London." On occasions during this period, it was sometimes still necessary to use some of the remaining supply of seasoned timber and quickly make some garden furniture to sell to desperately try to make ends meet. As the Transit van was sold many months earlier to raise some money, my car an old Triumph Stag was quickly pressed into service for a few months to take over the deliveries of these occasional items of furniture, until this much treasured car also had to be sold to help raise some much needed cash. It took almost two years of working long hours, with no holidays or days off before he finally managed to put together this large and varied collection of wood sculptures. These sculptures were again mostly of wildlife studies with many being life size, these included an Osprey catching a Trout, a pair of swimming otters, a running cheetah, a sleeping lioness, an Owl in a log and a pair of golden eagles, one of which was in full flight, all beautifully carved in very fine detail from Walnut, Tulip, Cedar, Willow and Lime wood. Several weeks to go before the all-important London exhibition this large and varied collection of sculptures were finally completed. Ian was then asked by two local art Galleries owners if he would be prepared to loan these sculptures, one for a newly opened gallery in Bournemouth and also a gallery in Romsey, prior to his exhibition in London. 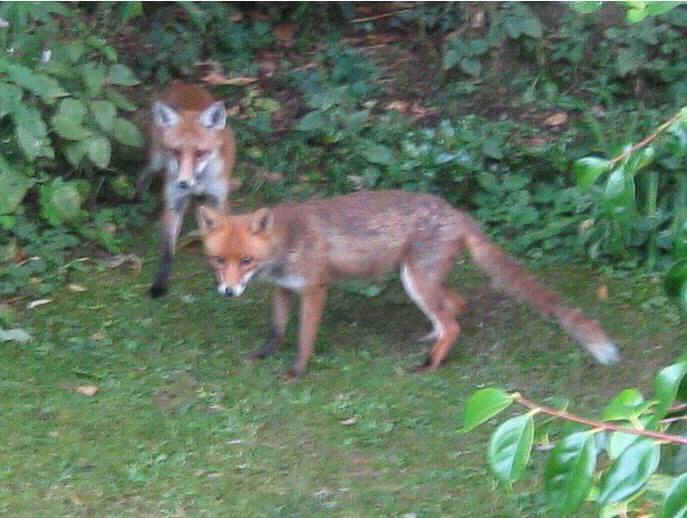 They thought the sculptures would be a nice contrast to the wildlife paintings and other sculpture they had on exhibition, they also hoped it might help generating some extra publicity for the art Galleries. The exhibitions certainly did manage to generated a lot of Media attention both pre and post exhibition; however not all in the way any of us had hoped for. In the early hours of the morning the day the exhibition was due to open, Julie the owner of the Bournemouth art gallery phoned Ian to tell him thieves smashed down the heavy plate glass of the art gallery broke in attempted to steal the sculptures. Those wood sculptures that were not damaged when the galleries heavy plate glass windows shattered and fell down on top of them were then promptly stolen. The vast majority of the collection he had worked so hard on producing had now been either stolen or were badly damaged, all those years of time, effort and expense Ian had put into his work had once again overnight come to nothing. The police however who were on the scene very quickly were very supportive and said they would do their best to try and recover the sculptures. After getting over the initial shock Ian of two years work being lost Ian then had the unenviable task of having to contact the London Gallery to explain the situation and that the large collection of wood sculptures he had promised them for their exhibition in a few weeks time were no longer available. The London gallery although sympathetic were quite understandably rather disappointed. This was to put back Ian's plans on a further major exhibition in London again for a quite a few years to come. 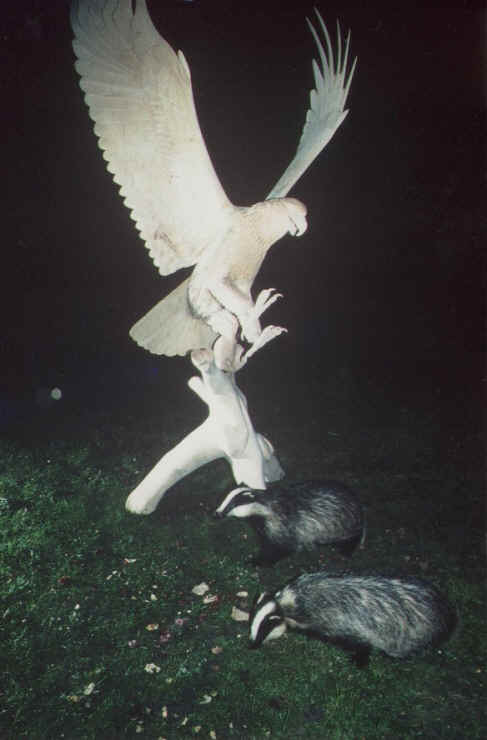 Fortunately however Ian’s centre piece of his wildlife exhibition was a newly created life size wood sculpture of an ‘Osprey catching a Trout’ carved from a single piece of wood was not on view at the time in the Bournemouth art gallery and was fortunately not stolen. 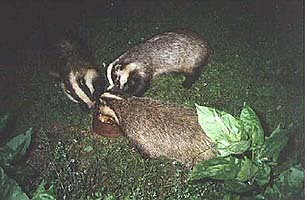 Weeks later the Bournemouth Police who had done an excellent job were good to their word and contacted Ian to tell him they had indeed managed to get some of the stolen sculptures back and quickly returned the large swimming otters which were a particular importance to Ian as they had each taken a long time to carve. Although Ian had lost most of his exhibition pieces he did at least now have some carvings namely the Swimming Otter and the Osprey catching a Trout which were then made available for the forthcoming exhibition in the art gallery in Romsey. After all the worry and disappointment of the Bournemouth exhibition the Romsey exhibition opened with a great fanfare with the various exhibits created by a number of different artists fortunately being met with great enthusiasm. Everything was in place for hopefully a good exhibition by all when in the early hours of the morning during the first week of the exhibition thieves managed to break into the Romsey art gallery and remove many of the exhibits, including once again Ian’s Swimming Otter and for the first time they also managed to steal Ian’s centre piece, the sculpture of the ‘Osprey catching a Trout’. If it wasn’t bad enough that two years work was lost, but now it transpires that although Ian had purchased insurance to cover such losses, the insurance company decided that it would in effect only pay out for the "costs incurred when reproducing the sculptures, however this does not include the profit element on your labour" ….. how much for a piece of wood.! Ian said "You couldn't help begin to think that perhaps after all these years I should give up trying to work for myself and get myself a proper job". "With two years work on what amounted to my entire collection of wood sculptures now either stolen or damage and now with the prospect of no insurance cover it did make things rather bleak. It also put a rather heavy strain on my latest bank manager, who once he was made aware of the situation promptly advised me to take my overdraft elsewhere". The search was once again to find a new bank manager this time a bank manager who not only had a lot of optimism and deep pockets but also a great sense of humour, a rather daunting and unlikely prospect but one that had to be achieved with great urgency. Fortunately however several weeks later and after many phone calls and letters, the insurance company finally relented and paid the insurance claim which helped the situation considerably. Although Ian badly missed not having his large collection of sculpture available for exhibition which would have enabled him not only to help get his work recognised but also hopefully to get some commissions, it did however allow him the respite of continually worrying about trying to pay bills and also having to continually write reassuring letters to his bank manager. "Up to this stage the size of the wood sculptures I produced were limited by the size of the trees I could find and obviously afford". Also the largest of these trees I had hoped to develop my skills on would have had preservation orders on them which prevented them from being felled anyway. However fate was again to lend a helping hand when Southern England was hit by Hurricane force winds, which uprooted millions of trees. Overnight I had been given a large supply of massive trees, many of which were donated free of charge by the local councils 'if I got them of the road'. With help from a friend and by hiring a lorry with a crane this task of hauling away the best of these fallen trees kept me very busy for weeks, once they were all stored away for seasoning, the timber was to last me for many years to come." "Up to this stage The size of the wood sculptures I produced were limited by the size of the trees I could find and obviously afford ”. Also the largest of these trees I had hoped to develop my skills on would have had preservation orders on them which prevented them from being felled anyway. 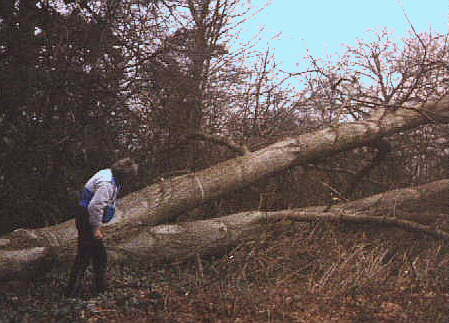 However fate was again to lend a helping hand, in October 1987 Southern England was hit by Hurricane force winds, which uprooted millions of trees. Overnight I had been given a large supply of massive trees, many of which were donated free of charge by the local councils 'if I got them of the road'. With help from a friend and by hiring a lorry with a crane this task of hauling away the best of these fallen trees kept me very busy for weeks, once they were all stored away for seasoning, the timber was to last me for many years to come." The first of these larger sculptures Ian started to experiment on, carved from one of these huge fallen trees was a 10 feet high Life size Bald Eagle in flight carved in one piece from within the fork of a 150 year old lime tree. ( shown above ) This sculpture was initially shaped with a chainsaw where it had fallen as it was far to heavy to be move as it was to far away from the nearest road, the tree having fell on the side of a hill didn't help much either. Ian spent the first week working on the sculpture during a freezing cold and wet January, trying to reduce as much of the weight as possible so he could eventually carry the massive roughed out eagle sculpture back to the comfort of his studio for finishing off. 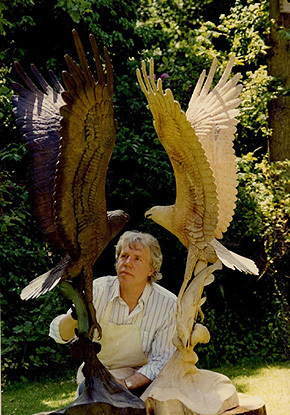 "Although I didn’t have a customer for the Eagle and had not attempted anything this size before spending a lot of time on the eagle didn’t really make a lot of sense to most people, but I thought having been given the tree to play with I just wanted to see if I could do it. As a chainsaw was not in my carving tool kit I hired one from a local tool hire company and early on Monday morning I started work cutting up the tree, I soon began to realise it was going to take me a lot longer than I thought and the cost of hiring the chainsaw for a few weeks was simply not something I could possibly afford to do, therefore not being able to finish it was now a distinct possibility, which was a great shame really because I thought it had potential and I was really enjoying working on it. At the end of the day as I drove towards the Tool hire company at the Sedgensworth industrial estate in Hampshire where I hired the chainsaw from I could see smoke rising in the distance in the direction of the tool hire company, when I got closer the road was cordoned off by the police and I could see fire crews damping down a building in the industrial estate, I then found to my astonishment it was the tool hire company which had caught fire. I parked the car up, grabbed the chainsaw and walked towards the remains of the hire company. The actual part of the building were all the equipment, tools etc was stored was completely gutted however the office alongside was relatively undamaged. I was then approached by the manager of the company who was walking out of the office at the time and seeing me standing there with his chainsaw in his hands said "As you can see we have got a bit of a problem here would you mind hanging onto the chainsaw for a bit as we obviously haven’t got anywhere to put right now. We will have all your details and I will phone you when you can bring it back, would you mind." Well what can you do if you someone is having a bit of trouble you try and help out when you can, so I said "Sure thing just give me a call when you are ready I will bring it back, best of luck." 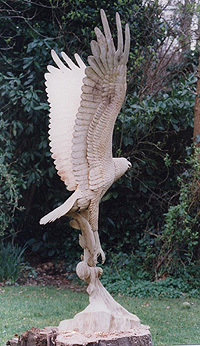 "It was over a month before the call came for me to return the chainsaw which by now had not only had helped me to prepare the bulk of the bald eagle which was now drying out in my workshop, but enabled me to rough out the shape of several other large sculptures I had begun working on from some of the other large lime trees that had been blown down in the storm winds I had also been given." Birds of Prey sculptures, particularly eagles are Ian’s favourite subjects to work on and are produced extremely realistically especially when they are carved life size, attention to detail is rather extraordinary especially to the flight feathers which can take hours to carve almost paper-thin, patience is essential as there are obviously hundreds of feathers on each bird sculpture. To relive the tedium during this stage he always tends to work on completely different style of carving at the same time. During 1990 the Museum Service in England toured a larger collection of Ian's wood sculptures throughout the year to many different Museums in Southern England. On this occasion this one man exhibition of Ian's work were mostly of wildlife subjects all realistically carved in fine detail with many of the sculptures being life size. Ian was also invited to demonstrate his artistic skill at art and craft shows throughout the country including such events as 'Art in Action' nr Oxford were the artists and craftspeople are selected purely on merit, with particularly emphasis on the skill and originality of design expressed in their work. 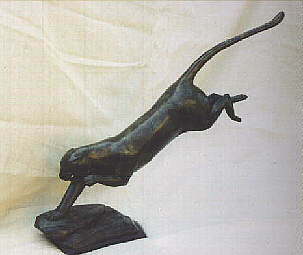 Many of Ian's sculptures were also exhibited in the museum 'Nature in Art' in Gloucester when he was invited on a number of occasions to be the 'artist in residence'. As well as a few setbacks he also had some rather lucky breaks which he feels tends to even things out quite a bit in the end." One of these lucky breaks was when the London Times newspaper ran a feature about Ian's work which was also appearing in a London gallery. 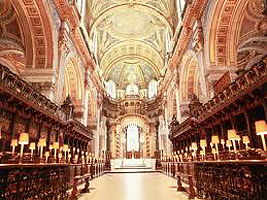 A member of the Royal Household saw his work and was so impressed by the standard of Ian’s carvings he was invited to London to discus a variety of unique commissions for Henry V11 Chapel in Westminster Abbey and St George’s Chapel in Windsor Castle, two of the most historical and widely visited buildings in England. 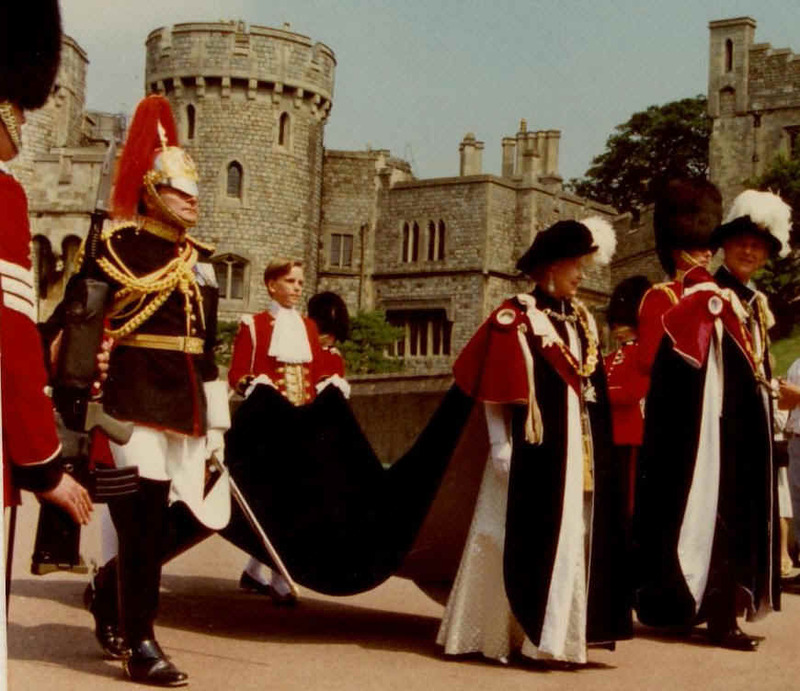 HM The Queen with the Duke of Edinburgh processing towards St George’s Chapel for the annual Order of the Garter service at Windsor Castle. 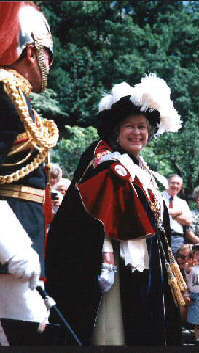 In 1989 Ian was officially appointed 'The Sculptor to the Most Noble Order of the Garter and Honourable Order of the Bath ' and spends on average five months of each year on a wide variety of unique commissions for the British Royal Household. 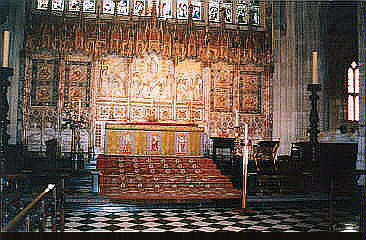 These commissions include, forty eight carved, painted and gilded Crests for the Knights of the Bath which were then placed in Westminster abbey, along with thirty nine Royal Crowns, Coronets and Crests for the Order of the Garter, which were then placed in St George’s Chapel in Windsor Castle when the latest Royal Knights, Ladies and Knights of the Garter are installed in St George’s Chapel Windsor in June of each year, in the Order of the Garter service, which is also attended by members the Royal Family. One aspect of his work Ian particularly enjoys is the frequent invitations he receives to both Windsor Castle and Westminster Abbey, to also be able to attend these historic ceremonies and to be involved in a tradition that has been going on for almost seven hundred years. "I often either get a letter or phone call from the Royal Household to tell me who the latest knights are to be installed, but HM the Queen informed me herself about Prince William’s being appointed as a Royal Knight of the Garter, when I was invited to Windsor Castle. We also had a long chat about many things in particular the Order of the Garter – Her Majesty is very knowledgeable. When I think about it, for twenty years my father was a Royal Marine, I was brought up in many council estates and military barracks all over the World, and here I was chatting away to HM the Queen over a glass of wine in her own home at Windsor…. It’s just amazing." Heraldic sculpture is like a picture language, full of signs and symbols that reflect someone’s life and career,’ Ian says. ‘For example I carved a phoenix rising amid flames from the Tower of London for Lord Inge, a former Constable of the Tower, when he became a Garter Knight, and a blue badger for Lord Butler of Brockwell – brock being the name for a badger. The Order of the Garter is the oldest British Order of Chivalry, founded in 1348 by King Edward III and reconstituted in 1805 and 1831 It’s restricted to the sovereign, members of the Royal Family, 24 Knights or Ladies Companion and certain foreign royals and is given as a mark of personal royal favour to honour people in public office, those who have contributed to national life or have served the Queen. ‘The technique Ian uses to carve his heraldic sculptures is totally different than his more realistic sculptures which are mostly carve from a single block of wood. 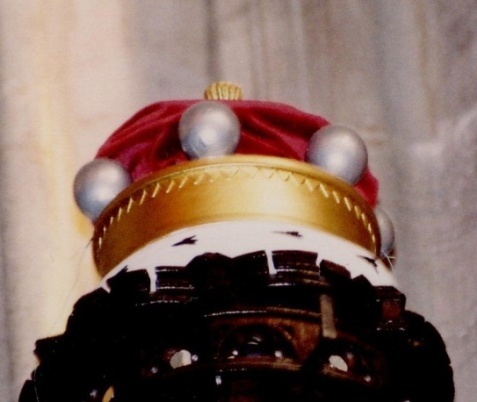 The crests are made hollow when possible to try and keep their weight down as they have to be carried up a 20 feet high ladder one handed when they are put in in position upon the Knights helms in Windsor Castle and Westminster Abbey. 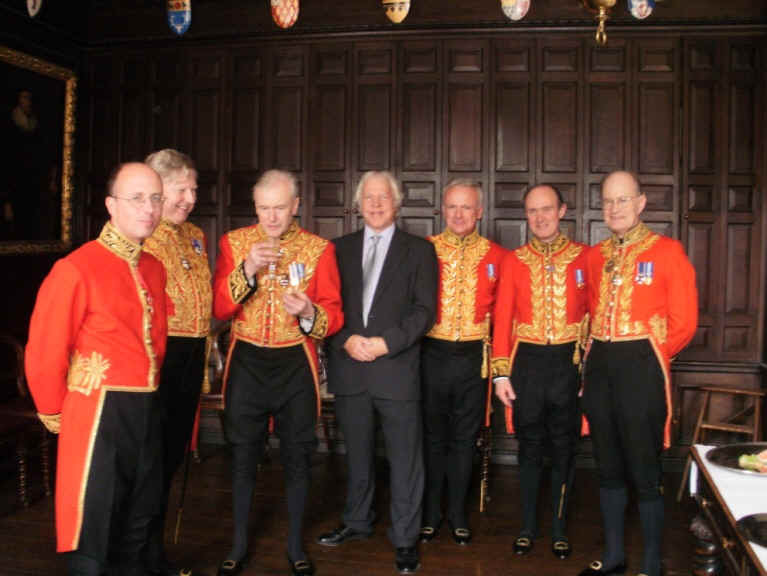 To view a short movie showing Ian carving a Knight of the Garter Crest , please click here. 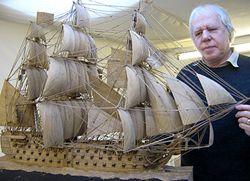 It takes Ian three to four weeks to carve each particular crown, crest or coronet in his studio, working from the beautifully painted one-dimensional water-colour designs he is given, which he then transforms into an impressive three-dimensional lime wood carving designed to last for centuries. 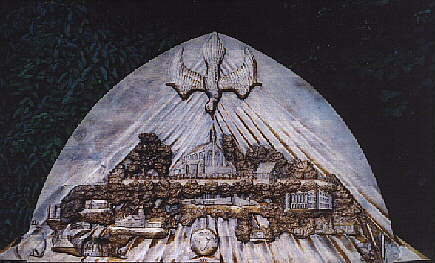 "One of the main criteria I was given by the member of the Royal Household when I was first asked to produce this work, was that ' the commissions will all be totally different so I must be capable of carving anything' a rather daunting prospect at the time I recall, as I had only been carving for just a few years". Also an added pressure was the sculptures obviously had to be carved to the very highest standard but also and had to be completed and delivered on time, as these Crowns, Coronets and Crests were an integral part of the State Ceremonies held at Windsor Castle and Westminster Abbey". Fortunately Ian has risen to the task since 1989 although his ability has certainly been well tested as each one of these commissions to date from the Royal Household is indeed all totally unique. 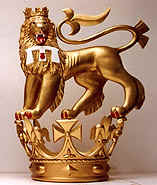 The first of these sculptures for the Order of the Garter was to be the carved and gilded Crown for HM Juan Carlos I of Spain to be placed in St George's Chapel Windsor Castle this commission was quickly followed by a carved and painted life size Heraldic sculpture of a Cockerel for an Admiral of the Fleet for the Order of the Bath which was then placed in Henry V11 Chapel in Westminster Abbey, these were the first two wood carving heraldic commissioned from the Royal Household. One of the more recently commissioned carvings he produced for an installed Knight of the Garter was a ‘Phoenix rising from the flames’, quite ironic really considering how Ian first started carving. These commissions for the Royal Household are often as varied as carving, Regal Lions to Mythical Unicorns and State Crowns and Coronets for Royalty and the Nobility from all over the World. Carvings also range from Majestic Eagles, to Busts of Men and Woman for Field Marshals, Admirals of the Fleet and Marshals of the Royal Air Force. 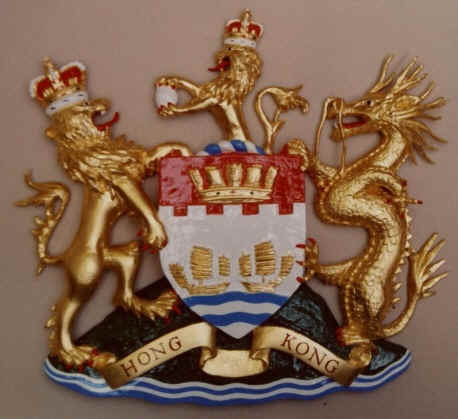 These designs also include other Animals, Birds and Flowers for Prime Minister and other Heads of State, more recently these commissions have included producing the 20 inches high carved and gilded Chrysanthemum Crest for His Imperial Majesty Emperor Akahito of Japan. On 23rd of April each year on St George’s Day, Buckingham Palace officially announce who is to be the latest recipient of the Most Noble Order of the Garter, the highest honour the Sovereign can bestow, a short time later Ian receives the detailed coloured drawings to work from. These carvings for the Knights of the Garter are then required to be completed in time for the annual Garter service held at St George’s Chapel Windsor Castle in June the following year. Fortunately these sculptures are usually spaced out quite evenly over the year enabling Ian to work on his other private and commercial commissions, however during HM The Queens Golden Jubilee year in 2002, fourteen commissions were received from the Royal Household all within weeks of each other which kept him extremely busy as they all had to be completed and installed in time for both these historic services in Windsor Castle and Westminster Abbey. 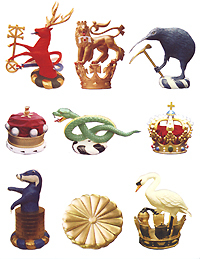 A small selection of the over eighty five Royal Crowns, Coronets and Crests that have been carved and painted by Ian G Brennan, before they were placed in both St George's Chapel Windsor and Henry V11 Chapel in Westminster Abbey for the Knights of the Most Noble Order of the Garter and Most Honourable Order of the Bath. 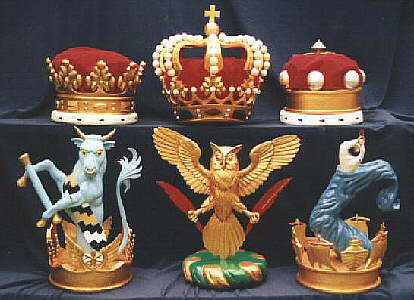 A selection of the 39 Crowns, Coronets and Crests carved and painted by Ian G Brennan between 1989 - 2009 for the Royal Knights, Knights and Ladies of the Most Noble Order of the Garter which were placed in St Georges’s Chapel in Windsor Castle. For a 360° Virtual Tour of St Georges’ Chapel in Windsor Castle to 360° Virtual Tours 360° Virtual Tours view many of the 37 carved and gilded Crowns, Coronets and Knights Crests which have been carved, painted and gilded by Ian G Brennan during the past 22 years ; please click here. Just over a year after the fire destroyed Ian’s furniture making workshop, although he had finally rebuilt his business, his newly discovered woodcarving skills began to take priority over his furniture orders and slowly he began to wind down the furniture making aspect of his work to concentrate fully on woodcarving. In 1994 however on one commission, Ian was to combine both his previous furniture making skills along with his carving expertise when he was asked to produce the Pascal candle stand in carved in oak for the Alter in St George’s Chapel in Windsor Castle. HM The Queen's daughter, The Princess Royal taking an interest in the relief woodcarving of the village of Warsash in Hampshire UK which was placed above the Vestry in St Mary's Church Warsash. Ian’s entrance port then placed on the starboard side of the middle gun-deck of this historic 104 gun First Rate Warship which was originally built in 1765. HMS Victory was Admiral Lord Nelson's Flagship at the Battle of Trafalgar and is the oldest commissioned Warship in the World. During 1989/90 Ian was invited by The Royal Naval Dockyard in Portsmouth in Hampshire UK to carve from huge solid blocks of mahogany an exact replica of the original Starboard Side Entrance Port on this historic warship HMS Victory, who's restoration is near completion.. 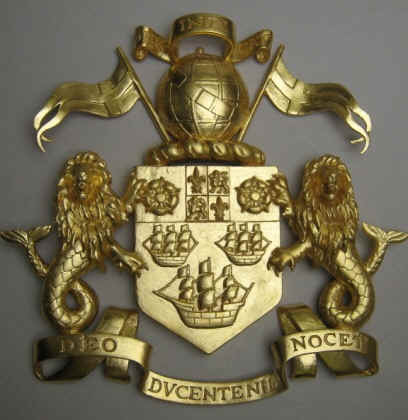 It has long been said amongst Ian’s family many of which including Ian’s father, have served in the Royal Marines and that one of his ancestors Marine John Brennan was killed onboard Nelson’s Flagship at Trafalgar. Although Ian was born in England his father was from Glasgow and a proud Scot, his ancestors however originated from the Irish republic and lived in and around Shannon the home town of Royal Marine John Brennan. 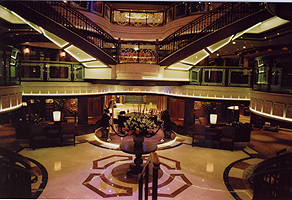 It was therefore quite ironic that in October 1990 Ian was commissioned to replace the starboard side entrance port on Lord Nelson’s Flagship HMS Victory which is now in dry dock in Portsmouth Naval Dockyard. During 1991 whilst Ian was working onboard replacing the starboard side entrance port amongst others, two large very old oak beams were removed from the lower gun deck of HMS Victory during the restoration program. As these beams were deemed in too bad a condition and therefore totally unsuitable to be restored and returned to the ship these oak beams were given to Ian by the ships crew to see if it were possible for Ian to produce ‘anything useful’ from any of them, although they still contained within the remaining sound oak, old hand made iron nails and copper bolts. Over the coming years various woodcarvings and carved relief panels showing the Victory in full sail were then carved in relief by Ian from pieces of these oak beams and then donated to the crew to help raise money for various charities supported by the ships crew including the BBC Children in Need program. 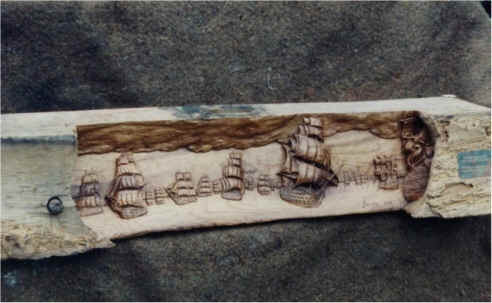 Out of one of large oak beam Ian carved a four feet long Battle of Trafalgar scene depicting HMS Victory about to break through the French and Spanish allied line which is now on displayed on the middle gun deck onboard HMS Victory. 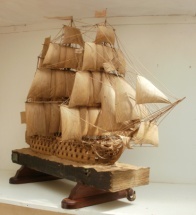 The other large oak beam removed at the same time was used to carve the HMS Victory sculpture ‘Running before the Wind’ and although this model has taken over 5000 hours of carve and looks very fragile being made of old seasoned oak it is exceptionally strong. One of Ian’s recent commissions from the Royal Household was to produced the carved and gilded Royal Crest and Knights Sword for HRH Prince William when he was made a Knight of the Garter in 2007, a piece of HMS Victory oak taken from the Victory sculpture was placed into the hilt of HRH Prince William’s Garter Knight sword which is now on display in St George’s Chapel in Windsor Castle. 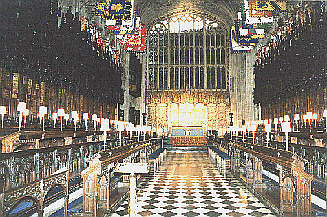 Traditionally since 1348, the latest Knights of the Garter have their carved and gilded Crest and Sword created and they are then placed above the stall (seat) were they are entitled to sit in St George’s Chapel in Windsor Castle. 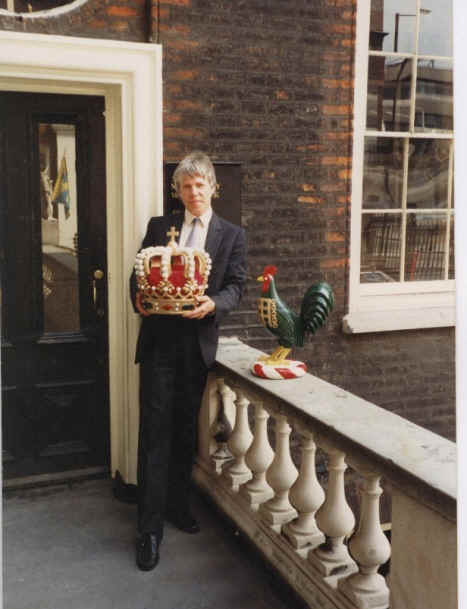 Ian was officially appointed the sculptor to the Most Noble Order of the Garter and Order of the Bath in 1989 and has since then been commissioned to create all the Royal Crowns, Coronets and Crests for the Ladies and Knights of the Garter and Knights of the Bath . Other restoration projects Ian has also been involved with include working in ''Southwick House" at HMS Dryad, which was General Eisenhower's Allied Headquarters in Southern England for 'Operation Overlord ' during WWII (where D Day was planned). During the recent restoration of this historic building Ian was commissioned to repaired and replace all the missing finely carved mouldings and detailed woodcarvings on the huge antique mirrors and picture frames which have hung on the walls in this magnificent historic mansion for centuries. 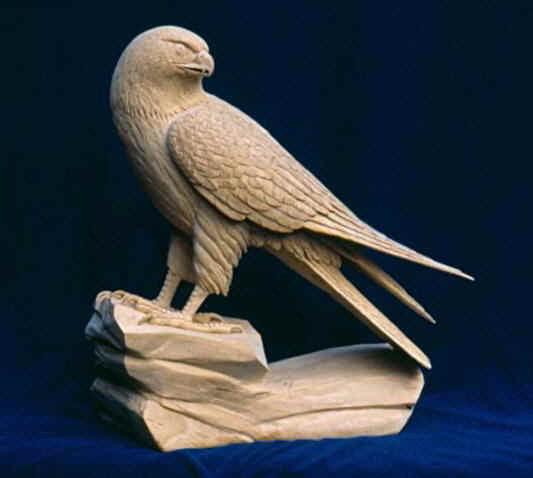 Ian was contacted by a prop’s buyer for the Granada TV company making the ‘Cracker’ Television series who were looking for a wood carver to produce an accurate woodcarving of a full size Falcon which was due to be filmed in few months time. 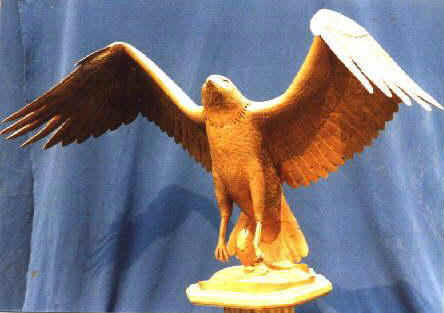 The props buyer said that the Falcon had to be carved in a very specific way, as the script required the actor describing in great detail the various aspects of the bird whilst he was working on it. As the Falcon was required to be produced accurately, Ian started try and find preferably a real falcon to look at or at least finds some good close up photographs in the library, unfortunately without much success. One morning Ian heard a real commotion going on in his back garden and looking through his studio window he saw a flock of Rooks swooping in and out of the oak tree in his garden and making an almighty racket. On looking up high in the tree Ian could make out the shape of a large bird caught up in the tree, on closer inspection to Ian’s great surprise it looked very much like the type of falcon Ian was desperately looking for as research for his carving caught in the branches by the Jessie attached to its leg. What to do… The Rooks eventually left the falcon alone and as it was clear the bird was going nowhere Ian phoned up the RSPCA and asked if anyone had reported a Falcon missing, they took Ian’s phone number and said they would get back to him. A short while later the RSPCA phoned back and said a falcon had indeed been reported missing a few days earlier and they asked could the owners come straight over and have a look. 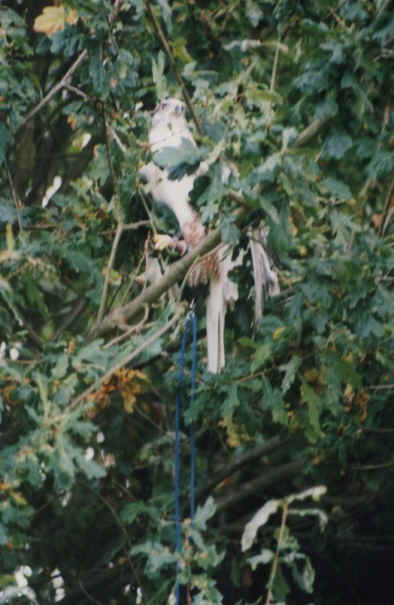 An hour or so later the owners of the Falcon arrived at Ian’s home and on looking up into the oak tree to their obvious delight they realised they had at last found their missing bird which they said days earlier had not returned from an exercise flight in the country side. The problem was the bird was well and truly caught high up in the oak tree the Jessie that was attached to its leg and couldn’t be reached without assistance. 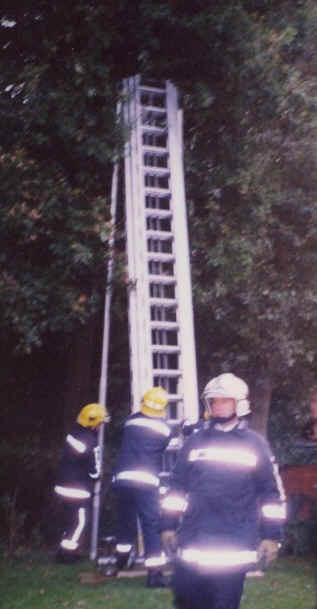 The owner said would you mind if I use the phone and see if the local Fire brigade could help in any way. Although they knew it could not be classed as an emergency the fire brigade kindly offered to come over and help rescue the bird, they said graciously they would use it as a training exercise. With the falcon safely rescued, the delighted owners said I could now have as much access to their bird anytime to help with my research for the carved falcon commission. Over the years many Art galleries particularly those in London had suggested perhaps Ian might consider producing some bronze sculptures to exhibit alongside his woodcarvings as the contrast between wood and bronze would be rather effective in future exhibitions. Also the prospect of being able to produce several limited editions from one sculptures rather than a one off wood carving made perfect sense especially for the art galleries. Although the though had a curtain amount of appeal to Ian, he was so busy producing his woodcarvings the idea of stopping his rather hectic carving schedule to experiment with a totally different medium did not really appeal to him at all and the idea of him also working in bronze was eventually abandoned. 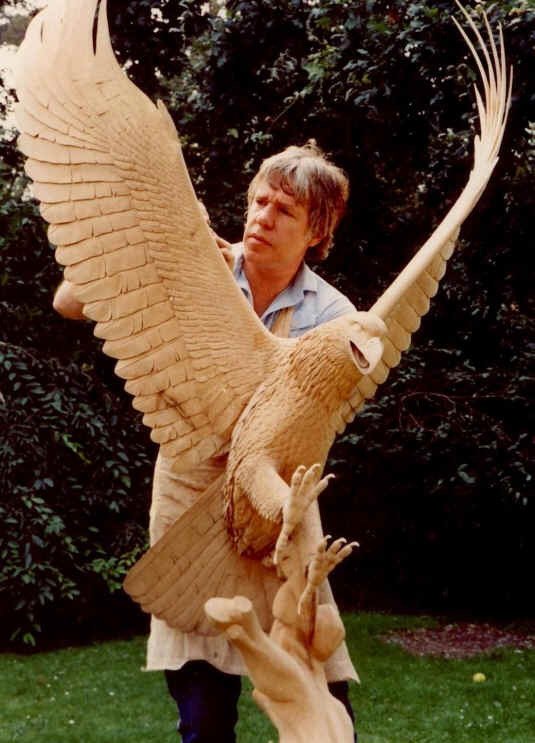 "However fate was again about to take hand, almost literately one afternoon when in 1996 Ian had a moments carelessness putting the finishing touches with a chainsaw to the crest of the wave on the base of the 'Osprey catching a pike' wood sculptures he was working on which caused serious injuries to the tendons in his left hand. The severing of the one of the tendons and seriously damaging another prevented him from holding carving chisels and therefore working for several months. The blade of the chainsaw hit the back of his hand and then quickly bounced of the metal casing of his watch which fortunately prevented more serious injury to the hand. Although I am right handed the left hand is the clever one that holds and moves the chisels the right hand merely holds the mallet." Ian was quickly taken to the hospital were luckily the exceptional skill of the surgeons and staff in the local hospital after a three hour operation eventually repaired the damage. Ian then had to attend the hospital for three days a week physiotherapy treatment throughout this period which eventually enabled him to fully regain movement in his hand, part of his treatment after his physiotherapy was also spent in the occupational therapy unit workshop which was attached to the hospital. Amongst the equipment in this workshop at the unit was a wood turning lathe something he had never used before, the subsequent lessons given by a member of staff at the hospital showing him how to use this lathe proved most useful, not only in helping him to gradually over the months get the flexibility back into his hand which is the prime purpose of the machines at the unit, but also learning how to make with the lathe potentially wooden crowns and coronets for the future. These crowns were made from the blank pieces of lime wood Ian started take with him into the hospital therapy unit most mornings. "I originally used to carve all the crowns and coronets by hand, but to suddenly now to have a wood turning lathe and an expert to show me how to use it properly whilst I was undergoing treatment was too good an opportunity to miss. "I am afraid however I soon discovered, as also did the staff and fellow patience in the unit that not all woodcarvers make good wood turners. "As much as the instructor tried to show me the correct way to use the lathe, after a while I would as often as not just for a moment loose concentration and return to my old carving ways and try to plunge the chisel in the spinning block of wood far too deep, with often rather unfortunate consequences, a terrible bang was quickly followed by frequently damaged pieces of wood or the occasional broken chisels flying at alarming speed around the hospital unit." 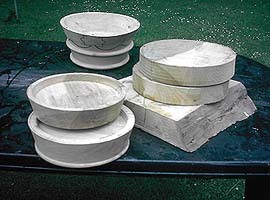 Eventually Ian's wood turning skills gradually started to improve and over the weeks and months that followed, these blank blocks of lime wood which he took with him each morning to the hospital unit, built up to a rather large collection of wood turned to the rough shape of Crowns and Coronets for future potential commissions for both Windsor Castle and Westminster Abbey. 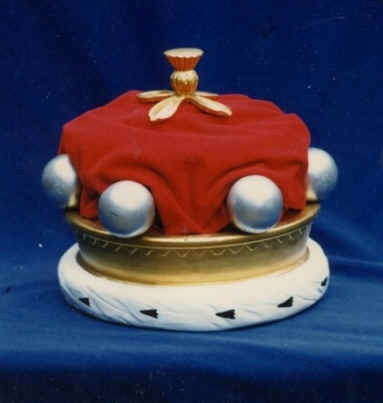 The first completed coronet Ian made from the lime wood blanks he turned on the lathe was the coronet for former British Prime Minister Baroness Margaret Thatcher when she was made a Lady of the Garter, the coronet was then placed on display in St Georges Chapel in Windsor Castle. The technique and tools required for woodcarving is also total different to that required in producing bronze sculptures. In you frequently start with a solid block of wood or stone and then slowly remove everything that is not required for the particular sculpture, obviously taking care not to remove something you shouldn't until you accomplish the desired result. With bronze sculpture you start with nothing but pieces of clay, wood, wax or plaster and slowly add the material together to eventually create the sculpture you are after and if you were to make a mistake you can simple add another piece of material on. Being unable for the time being to again earn his living as a wood carver once again started to prove rather difficult financially. Ian had until then finally managed after many years of hard work to at last escape the financial burdens of the past, now once again being unable to work things again started slowly to revert to the bad old days. 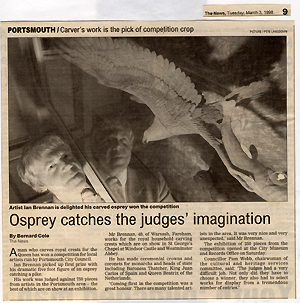 An article in a local paper however was drawn to his attention it was a competition for artists in the area being run by Portsmouth's City Council. Ian had never before exhibited any of his work in a competition before and rather unconfidently was reluctant to do so now, however the first prize of £ 500.00 especially at the present moment sounded rather attractive. After completing the application form the sculpture was delivered to the museum and was put on exhibition alongside many other art works by some very fine artists. 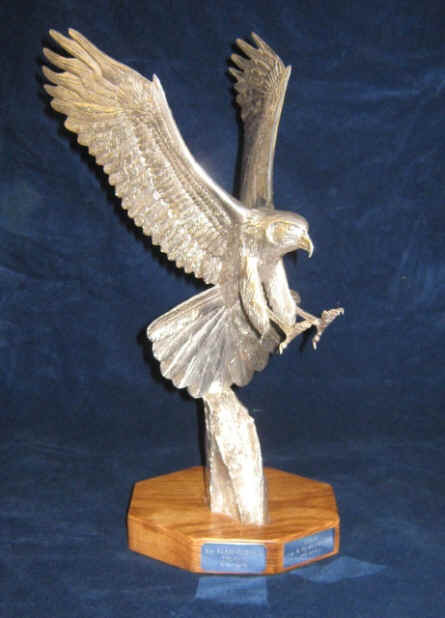 A few days later much to Ian's great surprise and obvious delight the Osprey sculpture which had been the cause of all his current difficulties, won the first prize. 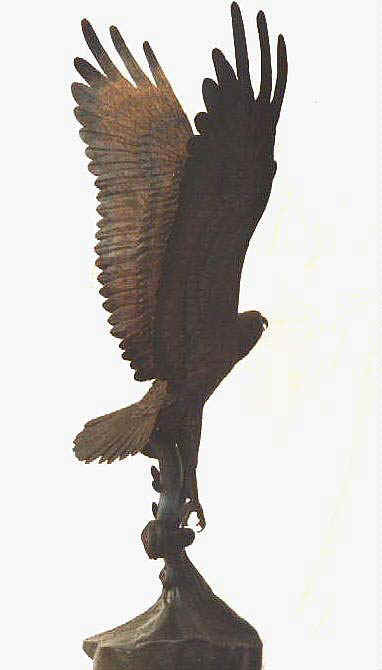 The Osprey sculpture had suddenly started to now earn its keep not only as a wood carving but later as it would turn out as a limited edition bronze. The accident to Ian's hand however had changed everything he simply had no choice but to follow the Doctors orders and to put on hold his many woodcarving commissions and therefore almost as a therapy try to work in a much softer more malleable material which was more suitable for his current situation. This way of working also helped Ian to slowly regain full movement back into his hand. The first of Ian's bronze sculptures was a small 'Elephant and calf ' made from clay which could easily be modelled with one hand. Ian was told by the doctors that although the injury to his tendons were healing well and should eventually lead to a full recovery must still not try and work again holding carving chisels with his left hand for several months. As any savings he had were now long gone the possibility of having these clay elephants now cast in bronze were very slim, it is a rather expensive process having such 'master copies' moulded and then cast in bronze, he thought it therefore rather pointless tying to build up a collection of clay sculptures only for them to be left to eventually dry out, crack and fall apart in the corner of his studio. He was then given the opportunity offered by the local foundry to watch the various foundry craftsmen in their work preparing other artists work, observing the clay master copy slowly being transformed into a superb bronze casting. 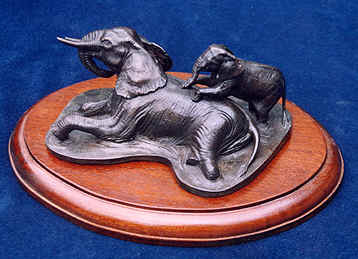 The techniques used to produce the flexible mould and subsequently the replica in wax which after many weeks in the foundry was eventually transformed in bronze. All though he was unaware of it at the time all the knowledge gained in the foundry process was later to prove invaluable in preparing his own future bronze sculptures. Several weeks after Ian's accident, friends of his Terry and Judy Elson, who over the years had purchase a number of Ian's larger wood sculptures arrived unexpected to his studio see what he was currently working on. Ian explained why he had his hand in plaster and that as he was obviously unable to carve at the moment, however he take the opportunity to try modelling in clay instead and perhaps one day also produce his work in bronze. Terry jokingly said when they win the Lottery they would pay to have all Ian's wood sculptures they now owned and the other sculptures Ian still had in his studio, moulded and cast in bronze. A few weeks later Terry and Judy retuned to Ian's studio and explained to his total amazement they had indeed just won the lottery, five numbers and the bonus, and true to his word they said they now would have Ian's sculptures moulded and produced in bronze. The following day a collection of Ian's original wood sculptures along with the elephants were taken to the 'Phoenix' foundry in Southern England and moulds were produced. 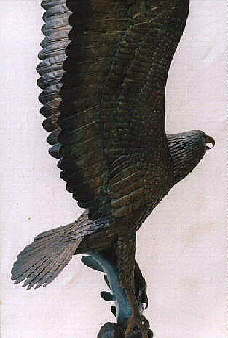 Within a year Ian's had now built up a large potential collection of both wood and bronze sculptures. 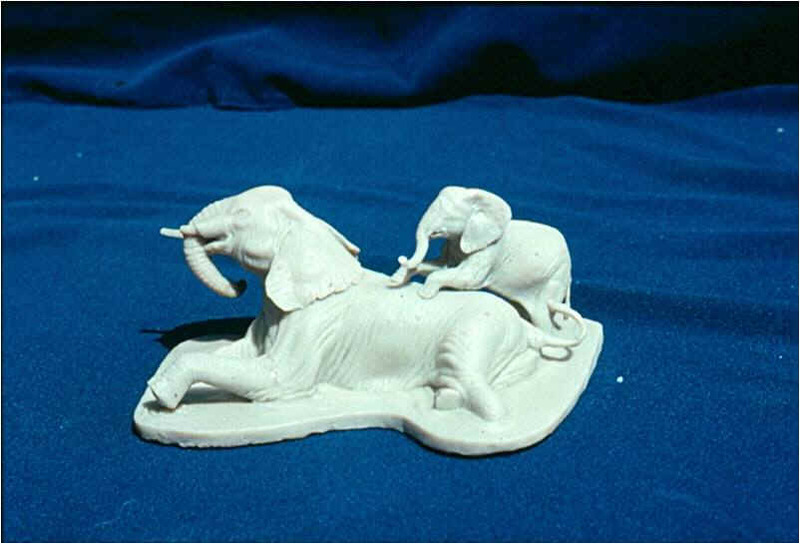 The first sculpture Ian had produced of his work cast in bronze was the small clay elephants, this sculpture were then followed by the Osprey catching a Pike. The normal process in the art foundry is that the artists original master copies which are usually produced in clay are once moulded discarded as the moulding process often damages the clay original. Ian's sculptures however apart from the elephants, were all carved from a single piece of hard wood and he was rather reluctant to say the least to have this original wood carving destroyed during the foundry process. All six wildlife sculptures above three of which are life size, were originally carved from a single piece of English lime wood or walnut moulded and then cast in bronze or sterling silver. The bronze and occasional silver sculptures collection now also included many life size sculptures including swimming otters, a mute swan and cygnets and leaping panther'. 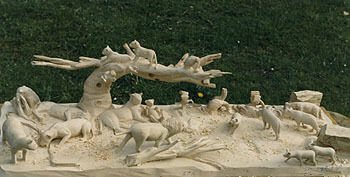 Smaller sculptures included a leopard sleeping in a tree and a pair of golden eagles'. 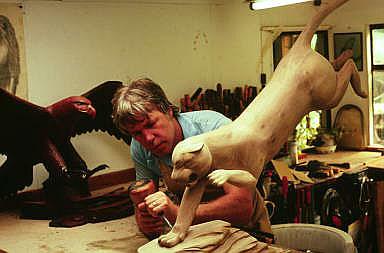 One minute Ian had built a reputation with his highly detailed wildlife woodcarvings the next he was now able to build up an equally impressive large collection of bronze wildlife sculptures. When appropriate Ian still prefers to produces the original master copy for the bronze casting from wood which is then moulded to produce the bronze sculpture. This highly detailed original woodcarving 'master copy' can after moulding be cleaned, polished and then retained. Many hours of researching the subject are undertaken using live studies whenever possible, but he also uses videos and books until he has built up a complete picture in his mind of what the intended sculpture should look like. Ian has a natural ability to see things three dimensionally, which is extremely useful when he is carving one of his life size sculptures from within the trunk of a massive tree. 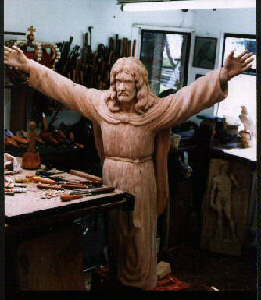 Ian’s over 300 commissions to date have been as diverse as carving a ten feet high Bald Eagle for an American Corporation, to a life size statue of the Risen Christ for a local church, a five feet high Lion for a Museum, to then carving 2 feet high gilded tooth for outside a Dental Surgery. 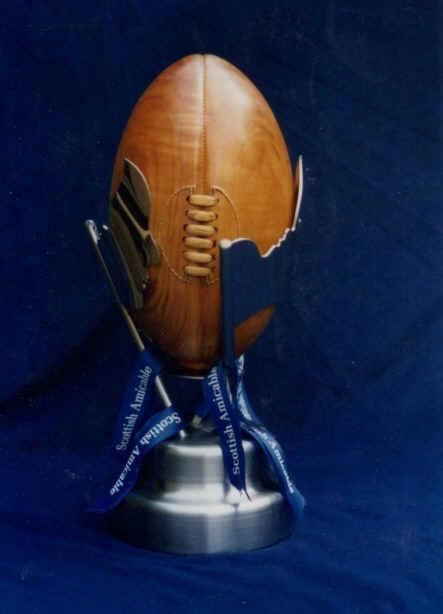 Ian has also been commissioned to produce various ornate Trophies which include the Scottish Amicable Rugby final Trophy held at Murryfield between Scotland and the Barbarians and more recently a solid sterling silver trophy of a Marsh Harrier for the Royal Navy. 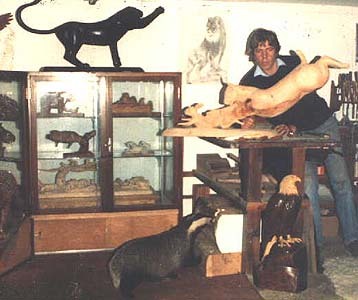 It is quite understandable why Ian particularly enjoys producing his wildlife sculptures, when wild Badgers, Foxes, Squirrels and Deer are regular visitors to his studio often whilst he is working, on occasions they also bring their young with them who can then be found running around his studio. 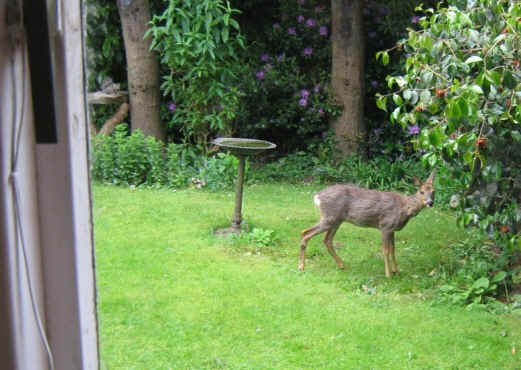 These visits also gives Ian the rather unique opportunity of studying the wildlife close at hand which is often the subject of his sculptures, the studio being built at the edge of woodlands in a nature reserve. Although Ian's furniture making days are long gone the old skills learnt are occasionally still put to good use, as he was commissioned to make the Pascal candle-stand for St George’s Chapel in Windsor Castle. Made from oak and designed to suit the splendour of this Medieval Chapel, the carved and gilded oak Pascal candle-stand was completed in time to be lit in a special ceremony by HM the Queen during the service at Windsor Castle before it was placed in front of the High Altar in the Chapel. Ian now often works on a number of different sculptures in two separate studios built alongside each other particularly when he is working in plaster which generated a lot of fine plaster dust which gets just about everywhere. This process going from one totally different sculpture to another throughout the week enables him to see each one afresh. 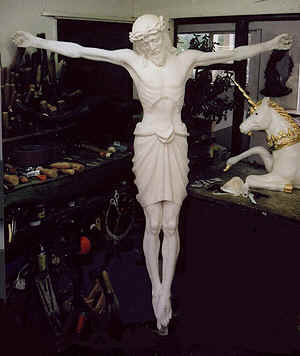 "The total contrast between perhaps one day working on a crucifix made from plaster for a bronze, to then perhaps carving from wood a gilded jewel encrusted Crown for Royalty is what makes his work so enjoyable". 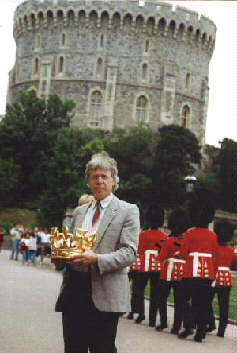 Ian G Brennan was invited to Windsor Castle to give a talk about the various aspects of his work as a sculptor. The informal talk which took place in the centuries old nave of St George's Chapel which is not only one of the most revered hallowed Royal shrines of the British Monarchy, but also one of the most beautiful buildings of its kind in the world, rich in history and a place of prayer. This subject of Ian's talk was to be not only about the large variety of different sculptures he has produced for the Royal Household, but also how he was first to discovered his by then unknown ability to be able to carve, after his business was totally destroyed in a fire and that he was totally self taught as a wood carver and sculptor. 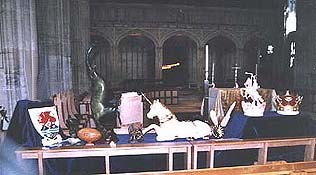 Although many members of the audience in St George's Chapel at Windsor were aware that Ian had created over thirty of the sculptures placed around the walls of the Choir in the Chapel, very few were aware of how his career as sculptor first started. 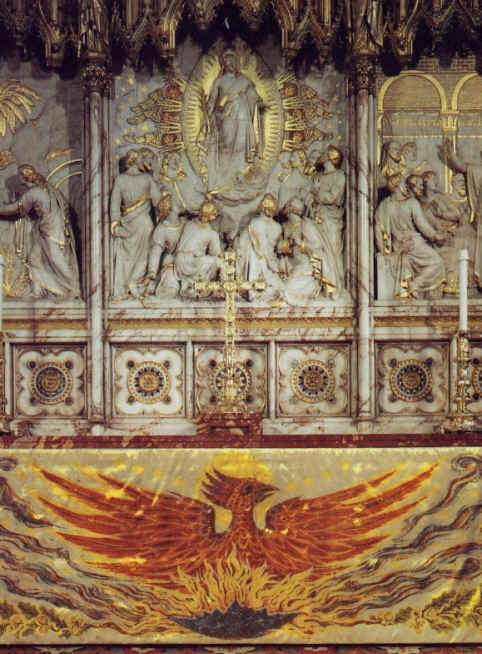 After being introduced to the audience in the Chapel by the Dean of Windsor at 2.00 pm, Ian walked to the centre of the St George’s Chapel to begin his talk; he then suddenly noticed in front of him a beautiful ancient fabric frontal which covered the Alter; this Alter cloth was richly embroidery with a stunning image of a Phoenix rising from the Ashes.… the date Ian was invited to give his talk at Windsor Castle also happened to be at 2.00 pm on May 7 which was exactly 21 years to the very minute he first discovered the beam that was burnt into a shape of a leaping dolphin lying amongst the rubble of his workshop….... Ian had finally come of age. So if you also then add these amazing lucky breaks, a great deal of determination with an unusual natural ability to be able to teach himself to carve and cast a wide variety of different subjects in many different mediums, Ian has now managed to achieved things which he never realised he was ever capable off…. If only Ian could have realised on that fateful day of the fire when he was digging amongst the burnt out rubble of his business trying desperately to find anything he could salvaging, that exactly 21 years later he would be standing in St George’s Chapel in Windsor Castle in front of such a distinguished audience, talking about a new and totally unexpected career. Ian G Brennan – Portsmouth Hampshire UK.